I was given the opportunity to view Most – The Deluxe Edition. I asked my hubby to view it too and he wrote the following review. There’s an old preacher’s illustration that if you’ve been to church more than twice in your life you’ve probably heard. It’s the story of a man who is in charge of a drawbridge that allows trains to cross over the river and boats to go under it. In the story the man has a son that he loves very much, in fact he is his only son and the most important person in the man’s life. The man takes his son to work one day and let’s his son play outside while he goes about his work. The time for the train to come across the bridge nears and just as the man is about to pull the lever lowering the bridge the sees that his son has gotten into the gears under the bridge and if he lowers the bridge, his son will be crushed! The man has a very difficult decision to make; does he lower the bridge, crushing his son but allowing the train to pass unharmed, or does he keep the bridge up, saving his son but killing everyone on the bridge. The movie Most – The Deluxe Edition is basically this old story set to film. It is a Polish film with English subtitles but it is such a moving story that the subtitles aren’t a hindrance to the story at all. 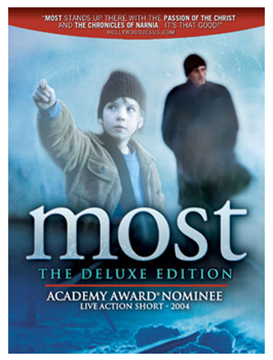 Most is a beautifully filmed movie and even though I’ve heard this story a hundred times (and probably told as many times) it was amazing the impact this story had. To hear the story is one thing, to see it play out in front of you is quite different. I would highly recommend Most – The Deluxe Edition to you and your family. It makes a great family night movie and could create conversation opportunities with your kids. MOST, the Czech word for "The Bridge," is a fitting title for this 21st-century parable about a loving father, his young son, and the fateful day when they attempt to head off an impending rail disaster. Hundreds of passengers aboard an oncoming steam train are completely unaware of the danger that looms as they head toward an open drawbridge.